Penny comes down the lane for the dunk over Smits, via GoldLakerLion. Kobe's dad showing off some serious elevation. The Matrix catches the alley over Starbury, via JRicherTV. Another Dr. J dunk on Kareem. Shaq with a birthday bash on The Admiral, via GoldLakerLion. Somehow this is only the 2nd Steve Francis dunk I have on here...need to work on finding some more. Via GoldLakerLion. Kevin Durant baseline smashin' on France, via ConeNBAVidz23. Drexler puts one down on Bill Cartwright, via GoldLakerLion. Scottie Pippen destroys Travis Best, via GoldLakerLion. This was almost like the original version of Lebron on Damon Jones. Michael Jordan hammers one on "The Hammer", via GoldLakerLion. Some rare footage of James Worthy dunkin' on Kenny Carr. Sick Desmond Mason jam over Varejao, via GoldLakerLion. Grant Hill spins in the lane and then dunks over Thunder Dan Majerle. Penny with a vicious and-1 dunk on Robert Horry, via GoldLakerLion. Ray Allen with a Team USA poster dunk on Jay Williams, via vaLTmac101604. Here's another You Got Dunked On exclusive dunk mix. 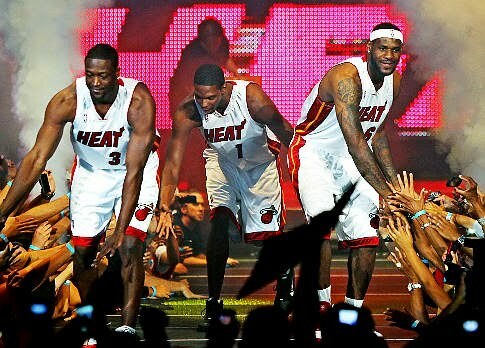 This one features everyone's favorite or least favorite trio: Chris Bosh, Lebron James, & Dwyane Wade. Showcasing their Top 10 dunks each from the 2009-2010 NBA Season.